Top smartphone maker, Xiaomi on Wednesday (28 January) launched the much awaited flagship handset Mi4 in India. The company has confirmed that the flagship Xiaomi Mi4 will be priced ₹19,999 and the first flash sale will kick-off on 10 February. Like all previous Xiaomi phone flash sales, prospective consumers are asked to get registered at Flipkart to become eligible to buy the Mi4. The registration window is slated to be opened today evening at 6:00 pm. In related development, Xiaomi India head Manu Jain has announced that the company would launch an online store of its own later this year in India, reported Hindustan Times. This is no surprise because the company follows the same business model in home market, China. With this, Xiaomi will have more control over the distribution of the devices and first-hand knowledge on demand in the market, which will certainly help in deciding the inventory capacity before the release of the device. 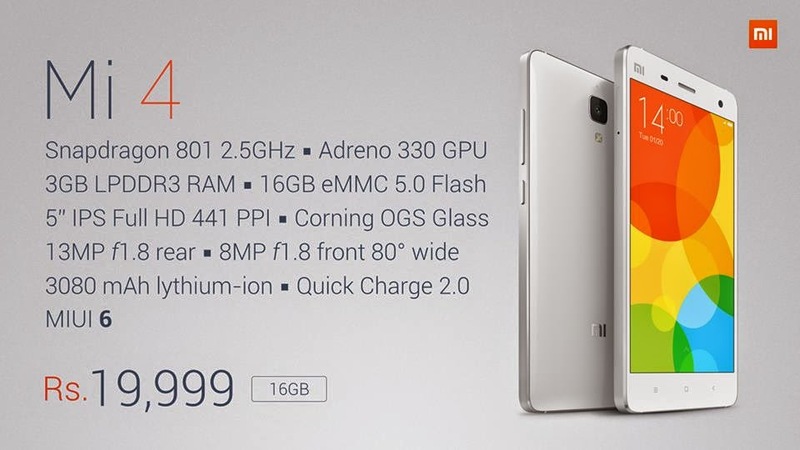 With a sub-₹20,000 price-tag, Xiaomi Mi4 is poised to give a stiff challenge to tier-1 brands like Motorola Moto X (Gen 2), HTC One M8 (& E8), Samsung Galaxy S5 and others.